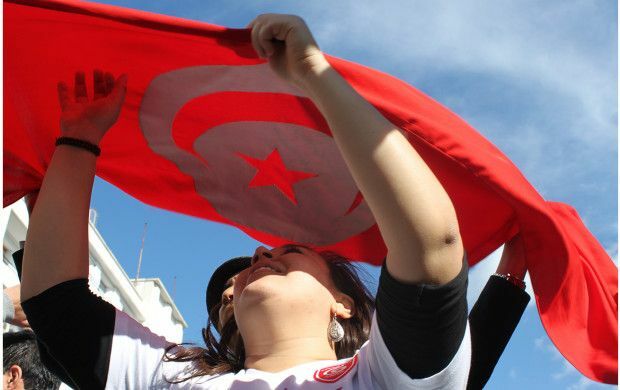 The Tunisian revolution is an unprecedented revolution on a number of counts. In the age of digital communication, it launched the marriage of new technologies and the street, introducing a new type of mobilization, new means of political action, and new types of artistic expression. The exhibition retraces the twenty-nine days of the Tunisian revolution from the spark set off in Sidi Bouzid to the fall of President Ben Ali. It is based on a vast archive made up of videos, photos, blogs, sound recordings, and also poems, slogans, songs, and civil society dispatches – all collected by the Doustourna network in collaboration with several Tunisian national public institutions. The Mucem, which has been involved from the outset of this collection, presents the results of this work further to the exhibition that took place at the musée national du Bardo.